It is always night in the city of Ember. But there is no moon, no stars. The only light during the regular twelve hours of "day" comes from floodlamps that cast a yellowish glow over the streets of the city. Beyond are the pitch-black Unknown Regions, which no one has ever explored because an understanding of fire and electricity has been lost, and with it the idea of a Moveable Light. "Besides," they tell each other, "there is nowhere but here" Among the many other things the people of Ember have forgotten is their past and a direction for their future. For 250 years they have lived pleasantly, because there has been plenty of everything in the vast storerooms. But now there are more and more empty shelves--and more and more times when the lights flicker and go out, leaving them in terrifying blackness for long minutes. What will happen when the generator finally fails? Twelve-year-old Doon Harrow and Lina Mayfleet seem to be the only people who are worried. They have just been assigned their life jobs--Lina as a messenger, which leads her to knowledge of some unsettling secrets, and Doon as a Pipeworker, repairing the plumbing in the tunnels under the city where a river roars through the darkness. But when Lina finds a very old paper with enigmatic "Instructions for Egress," they use the advantages of their jobs to begin to puzzle out the frightening and dangerous way to the city of light of which Lina has dreamed. 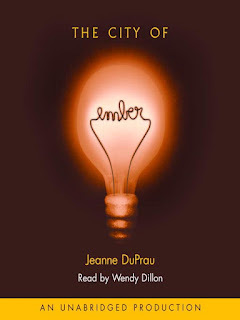 When teenagers Lina Mayfleet and Doon Harrow lead their people up out of the Earth, fleeing their dying underground city of Ember, everything is new and a little frightening to the refugees--the sun and the moon, birds, trees, fire…and the people of Ember are strange to the 322 citizens of Sparks, one of the few towns on Earth to survive the time of The Disaster. How can they feed and house the 400 Emberites, the leaders of Sparks wonder, when they have just begun to be able to feed themselves comfortably? But if they don’t, these underground people with no survival skills will surely die in the wastelands. They take them in as best they can, but grumbling and bad feeling grows on both sides. Lina returns from a failed search for her persistent vision of a city of light to find the town, egged on by the power-hungry young thug Tick, once again at the point of war, forgetting how the Earth has been destroyed before. This is an audio that I really enjoyed. It reads (listens?) like a middle grade book. The people of ember were a bit innocent because they were so protected and controlled. I loved to listen as they discovered things like matches. At the same time, these moments could be a bit boring since I knew what they were and I just wanted them to hurry up and figure it out too. I really really loved the narrator and I initially picked this series because it was short ;) but I fell in love with the sweet story. I think this is a great story to listen to with your kids (if you are in the habit of doing this). I didn't get lost or feel like the story was too drawn out. It is a cute story. 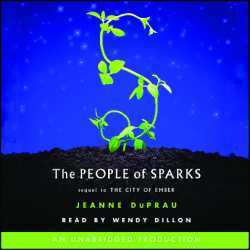 In this version we are in the City of Sparks. I won't tell you where that is or how we get here. I enjoyed the first book better than the this one but this one is still good. Again the narrator is awesome, but some of the voices that she uses for the new characters are bit annoying (i.e. Tick). I'd say the first half of the book moved too slow for me, even in a short audio, but the second half more than made up for it. I really found myself constantly switching sides and I think the issues expressed are difficult ones. I love the message of this story and found it very telling of human nature. I think this is a great discussion book for middle grades. I'm really enjoying this series and I will continue on through audio. Anybody like reading Middle Grades? Or is that too young for you?